Investors looking at energy stocks always have a lot to sort through. At the moment tensions in the Middle East, including over the Suez Canal (left), are top of mind. 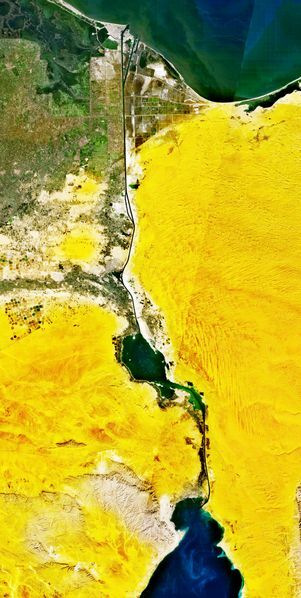 Egypt controls the Suez Canal, the route by which much of Europe’s oil is moved from the Middle East. At first there were concerns about the impact of instability following the demonstrations in Tharir Square, today tensions between Israel and Iran have the canal top of mind. Geopolitical risk is only one factor. Environmental issues loom large for the energy industry as well. The effects of BP’s Gulf Oil spill, last year’s biggest energy story and environmental disaster, linger and likely will continue to for some time to come. All that’s before you even start to dig into the details of any particular company’s prospects. For insight on investing in this complicated sphere, Portfolioist caught up with Phil Weiss, a senior analyst with Argus Research. Weiss has been following the energy sector for almost five years and is ranked by both Bloomberg and the FT/StarMine survey as one of the top analysts for the sector. He’s also a Certified Public Accountant who earlier in his career worked at Deloitte & Touche, so he enjoys drilling into his company’s financial reports. Portfolioist: Is Egypt weighing heavily on your take on the sector? Weiss: I tend to see it as more of an isolated event than anything else. The danger would be if they were going after ships on the Suez Canal. The biggest concern I have is if this starts to spread, if other countries follow suit. If something were to happen to set the whole region into turmoil then all bets are off. There is geo-political risk in this sector. Portfolioist: I, for one, am surprised there wasn’t more of a reaction in oil prices. 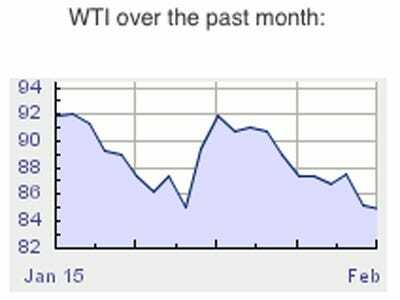 Weiss: We (in America) think of WTI West Texas Intermediate (as the price of oil.) That went up some and then down. 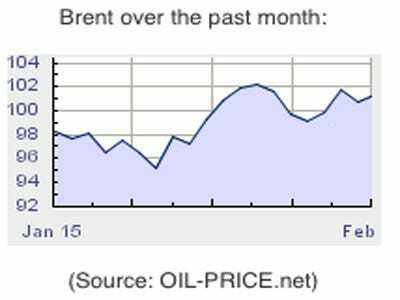 What we have seen is that Brent Crude from the North Sea is up. The disparity between WTI and Brent is at record levels. The difference surpassed $15. I’ve never seen it that high. Weiss: If something were to happen where you couldn’t use the Suez Canal that could be one reason. Also under accounting rules most refiners use LIFO (last in, first out) accounting. There have been stories of them drawing down inventory at year end. Under that accounting method, the last oil bought is considered the first sold, so when prices rise, you can reduce taxes by managing inventories. It’s had an impact on refining too. With North Sea Brent being so expensive it’s a little better for refiners here. They could ship refined product to Europe. Also, there has been an increase in the amount of pipeline capacity into Cushing, especially from Canada, which has also pushed inventories higher. Portfolioist: At Argus you give a current recommendation on a stock, and also a 5-year recommendation. Are there certain things that are most important for an investor with a longer time horizon? Weiss: If I’m thinking of things over a longer term I’m more sensitive to cash flow. There are a lot of ways to measure a stock, traditional metrics like price-to-earnings ratio, or price-to-sales, or price-to-book value. But what really drives a business is how much cash flow it produces and how much of that can be reinvested in the business or given to shareholders. Dividends are so important over the long term. What is your cash flow and what is your cost structure? Another one of the things I think about a lot is where the direction of commodity prices is going longer term. Portfolioist: That’s tough to predict. Weiss: There are so many factors that come in here. In 2008, 2009 the price went all the way up to nearly $150 and back down to the mid-$30′s. No one predicted that and you can’t. It’s not an industry that reacts the way you expect an industry to react. Usually in commodities when prices get too low the highest cost production goes off line. But in oil, it’s not always the highest cost barrels that come out of the equation. Portfolioist: One reason for that, you explain, is that so much oil (80-85% of the world’s supply) is government owned or owned by State controlled enterprises, and they may have certain quotas to keep to for reasons beyond profit. Portfolioist: Long-term thinking about energy commodity prices, where do you come out? Weiss: I can be comfortable with the statement that all the cheap oil has been found. There are billions of barrels in Brazil or the Gulf of Mexico, but, they’re not cheap to produce. When you have to spend multibillions of dollars to find a field, develop a field, put infrastructure in so you can deliver from it, your costs are a lot higher. It’s not like going to Saudi Arabia and drilling in a big dessert. That’s why cost and cost discipline are so important. Portfolioist: With the memory of the Gulf spill still so strong, when will drilling there get back to traditional levels? Weiss: There have been some permits granted on existing fields, but progress is slow. You still have rigs out of work but they’re allowing maintenance type activity and where there’s already been some activity (where it’s not a brand new site) there’s been a little bit of a thaw. It’s not until somewhere next year that we can imagine things being somewhere like the pre-spill days. It seems like there won’t be any drilling of new fields at least until that time. Portfolioist: You talk a lot about management in your reports. In an industry that’s becoming more and more technical, why is management such a core factor? Weiss:This is a commodity industry, so I like to find the best management teams because those are the guys who will do the best job of managing cost s and investing in projects that will get good returns. Effective capital allocation is an integral element of managing an oil and gas business. Portfolioist: Most investors applaud stock buy backs on the grounds that fewer shares outstanding mean more earnings for theirs, but you’re not always a fan. Weiss: Companies in my industry don’t always buy back stock for the right reason. You should buy back because you believe the shares are cheap. If you look at 2008, that’s when Exxon Mobil (XOM), for example, was buying back the most stock. When it was the highest—they bought back stock more than $30 billion of stock that year, and at its high, it was 90 plus dollars. The stock subsequently fell below 60. That’s not a good deal; it really represents a destruction of shareholder value. “The question to me is will they let BP get back to work in the Gulf? I believe ultimately the company is going to survive this. Exxon Valdez took 19 years to settle. If I’m a long- term investor and could dollar cost average into a position over time, I think five years from now the stock will be more valuable. Weiss likes the mobility of the oil services companies and rig owners, the fact that they can do business around the world and don’t have to own the commodity in the ground. Not having an interest in owning the commodity can make it easier to work with many of the government-owned entities. Service companies like Halliburton are at the forefront of horizontal, directional, and other technical drilling advances that can help make existing and future wells more productive. Already a leader in unconventional oil and natural gas drilling in the US, Halliburton is looking to leverage its expertise and use some of the same techniques in Poland, China, and other markets. And they’re trying to grow their expertise in deep water, Weiss explains, not just the Gulf of Mexico, but in Brazil, West Africa, and Asia. The stock of this rig operator is more expensive than Halliburton, but has one of Weiss’ favourite management teams, and a much younger, more efficient fleet of rigs than competitors, so it can charge higher day rates on its equipment and customers still come out ahead because the rigs can reduce drilling time. Though it’s got a big exposure to the Gulf of Mexico and things are slow there, the company’s used its strong balance sheet to gobble up assets at good prices, putting them in a position to ” emerge from the post-Macondo world in a stronger position,” Weiss says, referring to BP’s Gulf spill. One of the only independent exploration and production companies that Weiss finds well-priced. They sold a bunch of their Gulf of Mexico assets at just the right time (before the spill) and Weiss thinks their $3.5 billion stock buyback program is well-timed. Does a good job getting the most out of fields that the biggest companies no longer want and using enhanced oil recovery techniques to increase the amount of oil it can recover from a field. Weiss says the management team is the best of its peers, and its cost structure is good. One of his favourite integrated oil companies. In the early stages of a restructuring program that involves selling a lot of assets, buying back stock, becoming a more efficient producer. Weiss is leery of some unusual accounting practices the company uses, which are less transparent than the industry norm and also makes their costs look lower than competitors. The company has also lengthened depreciation lives on some of its assets over time, something that boosts income, and he wonders if their very long term hedging programs aren’t being used too much to support an otherwise weak balance sheet. Management has announced some recent initiatives that could help, but Weiss wants to see them put in place. “They’re not just a natural gas company anymore, hedging is part of the business and so is buying and selling real estate. I could argue that they’ve become more akin to a hedge fund,” Weiss says. Getting ready to spinoff a big chunk of their business, but Weiss doesn’t love what they’re holding on to: low margin retail operations and refineries that can’t process the most profitable grades of oil, a business based in the tough Northeast market, and a logistics business in which they own less than a majority stake. ” Not a strategy I can really rally behind,” he says. Price takers, with low return on investment and low margins.